The space of the «Pre08» atrium is divided into zones employing some unusual and eye-catching solutions. The central staircase with the symmetrically arranged escalators on either side became the principle focus of the design. It consists of four strides and is about twenty meters long. To make the massive construction look less heavy, the railings were made of transparent glass and decorated with plants. The architects insisted on living instead of artificial trees despite the inevitable difficulties with care. For the plants to get maximum light, special lights were installed. 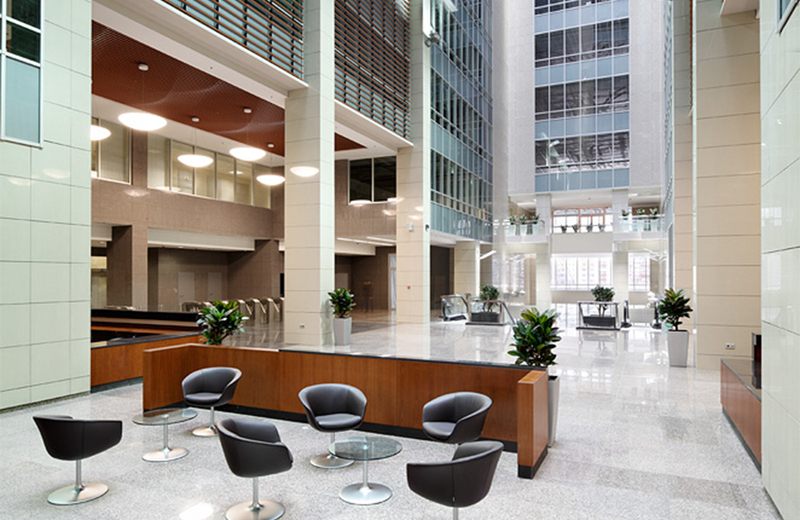 Comfortable lighting (about 300 Lux) covers the entire area of the atrium. This was created with the use of powerful lights (400 W - 1kW) covered with special facetted mirrors that gave a steady stream of reflected light. Another unusual solution was the use of lath structures in different planes. These were used for the ceilings in receptions zones and were vertically fastened to the glass-glazed entrances to them. Such unifying element brought variety to the surfaces and added color and detail. At the back of the lobby is a recreation area furnished with modern ergonomic furniture - a cozy place, convenient and comfortable to meet or wait. CFT develops software for banking institutions, and conducts trainings to work with them. The building is located in the southern part of Moscow, between one of the main highways, Warsaw highway, and Novodanilovskaya embankment of the Moscow river, on a plot of 4.99 hectares that is a part of a rehabilitated industrial zone. Business Center “Romanov Dvor” where Christie’s office is placed, is 3-storey building with a pitched roof and attic, it is located in the heart of Moscow.